This is not a problem unique to football. As Eileen McDonagh and Laura Pappano point out in their book “Playing With The Boys” most sports hsve gendered rules. That does not make FIFA right. Of course the rules should be the same for men and women. And to be fair at the elite level they are. At the 2012 Olympics the only differences were they were 12 teams in the women’s event compared to 16 in the men’s (why?) 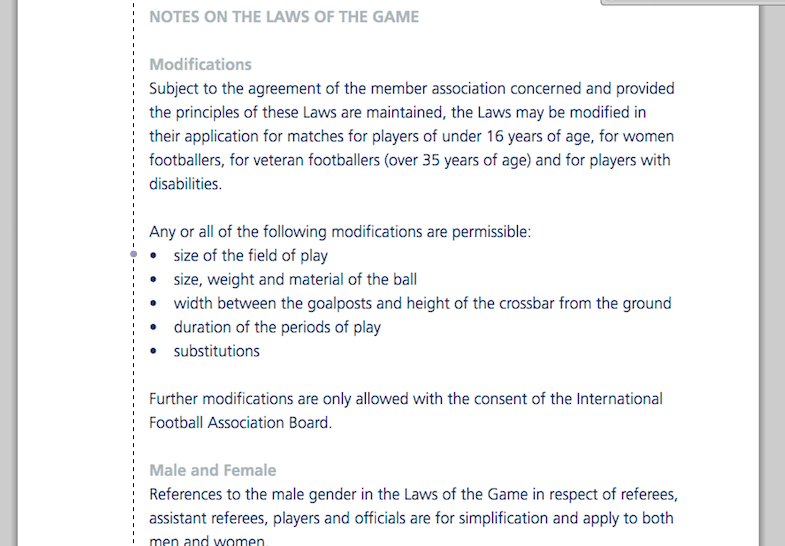 and the men had an age limit that the women did not(but that is more to do with FIFA not wanting the men’s event to be a second WC). One thing puzzles me. Why do some women support different rules for women? Last year on the BBC’s “Women’s Football Show” a female player (don’t recall who) sugested smaller goals for women’s matches. Why? Doesn’t she realise that plays into the hands of people who think women’s football is rubbish? As a mere male I can’t understand wonen like that.